Over the past few months, I have been inundated with emails about my potting shed. Most people want to know where they could purchase the same kit. When I explain that the shed is Joe’s original design, they want specifics. So with a lot of help from Joe, here is a post that has been a long time coming. Additional photos and information can be found in “The Potting Shed” tab above. Little did I know that that sentence, a seed traveling on waves of sound, would eventually settle into one of the folds of Joe’s brain, taking root and springing into action. Gardening is a gift that keeps on giving – and this is especially true of the Planting Fields Arboretum, a jewel of a gift on Long Island’s Gold Coast. William Robertson Coe, who made his fortune in marine insurance, built the mansion in 1921 in the style of a 16th century Elizabethan country home – but it’s the park-like 409-acre estate, designed by the Olmsted brothers, that brings gardening enthusiasts, walkers, brides, and myself back in time. There is nothing quite like humidity in New York. With its density and weight, it has a presence – and it likes to make its presence known, often making the blacktop-enhanced summertime heat seem that much more oppressive. And that kind of weather is perfect for a car-subway-walk field trip. The idea was inspired by a recent article in the New York Times which focused on the Greenwood Heights neighborhood of Brooklyn, and its historic cemetery. 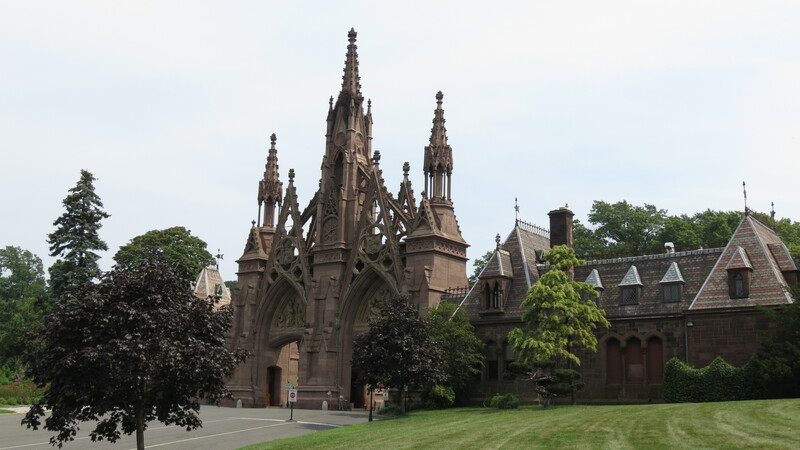 Situated on 478 acres, Green-Wood Cemetery was founded in the 1830s and is now the final resting place for more than 550,000 souls: politicians, soldiers, actors, dancers, freed slaves, designers, and journalists among them. At one point in the 1850s, the cemetery, with path after path named after plants, even rivaled Niagara Falls as a tourist destination. On this very hot and very humid day, there are few visitors approaching the ornate gateway. 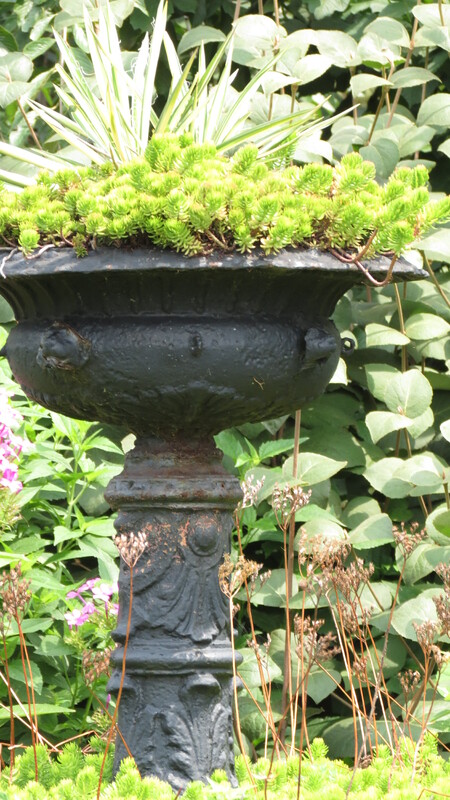 The sedum in the iron birdbath seems to enjoy the heat, but the big-leafed coleus is much more content in the shade of the enormous archway. The only noise is the squawks from above. 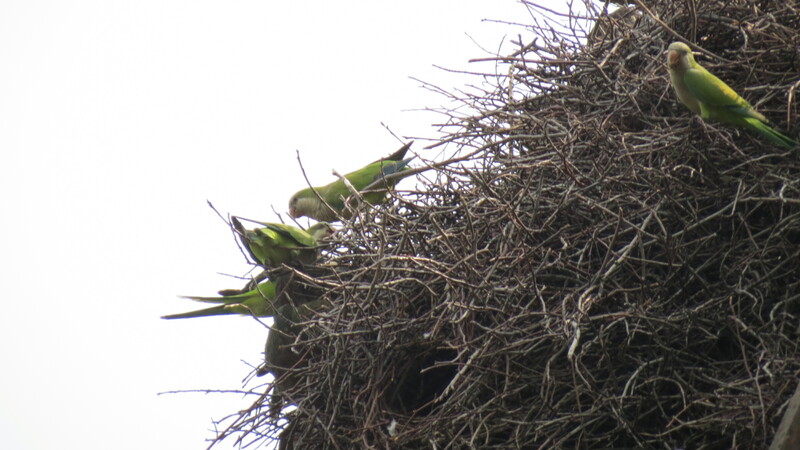 The bird call sounds familiar but out of place in Brooklyn – but there, nesting in the center spire of the gate, is a flock of parrots. 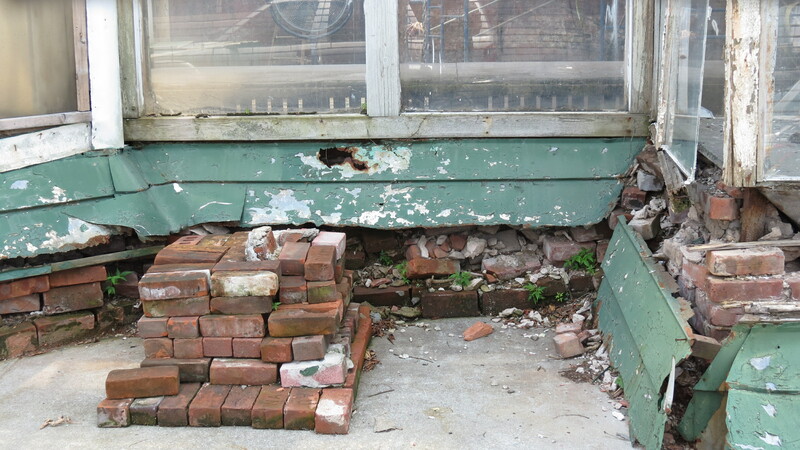 Just across from the cemetery’s main entrance are the remains of a wood-and-glass greenhouse. 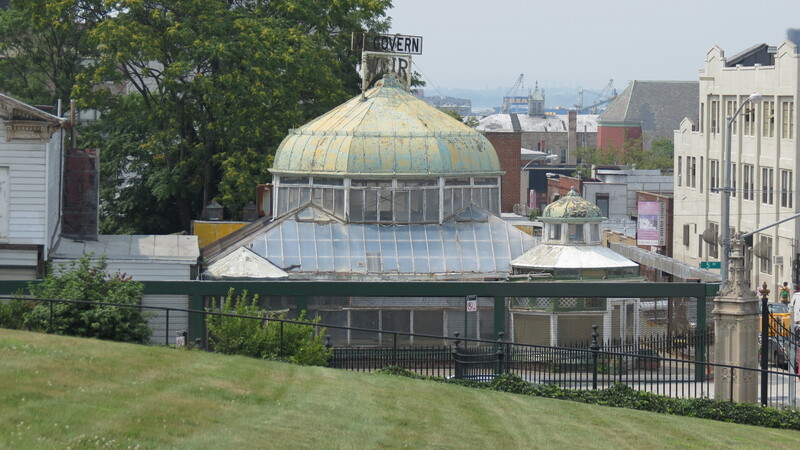 The greenhouse once belonged to James Weir, Jr., who had also built more than 20 other greenhouses and nurseries throughout Brooklyn. In 1971, the McGovern family, also in the florist industry, bought the property. 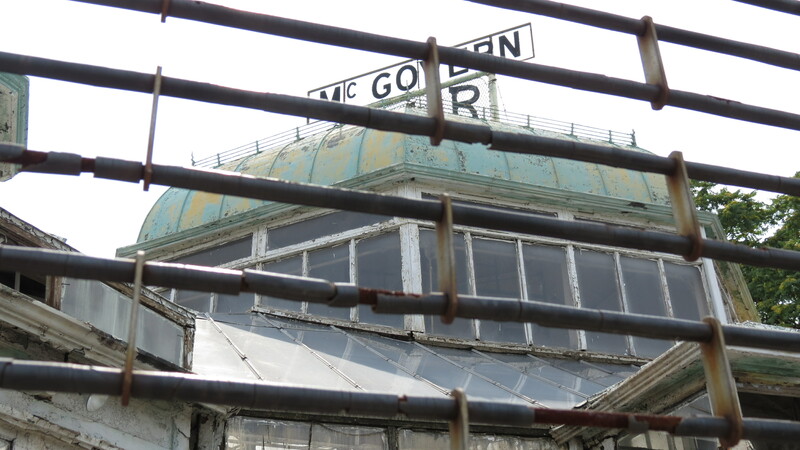 Over the decades, the greenhouse, now considered a landmark as the only Victorian-era greenhouse still standing in New York, has fallen into disrepair, with peeling paint, rotting wood, crumbling foundations, and missing and broken panes of glass. 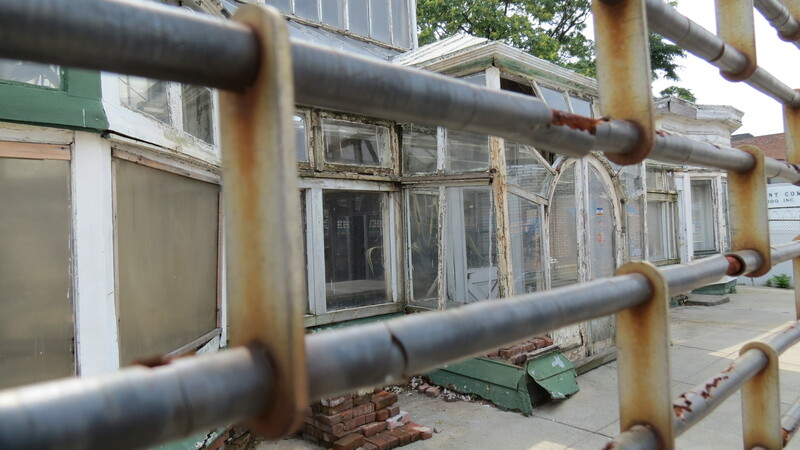 A year ago, however, Green-Wood cemetery purchased the greenhouse and is in the process of turning it into a visitors’ center. And so, this relic now sits behind security gates, waiting to be reborn. 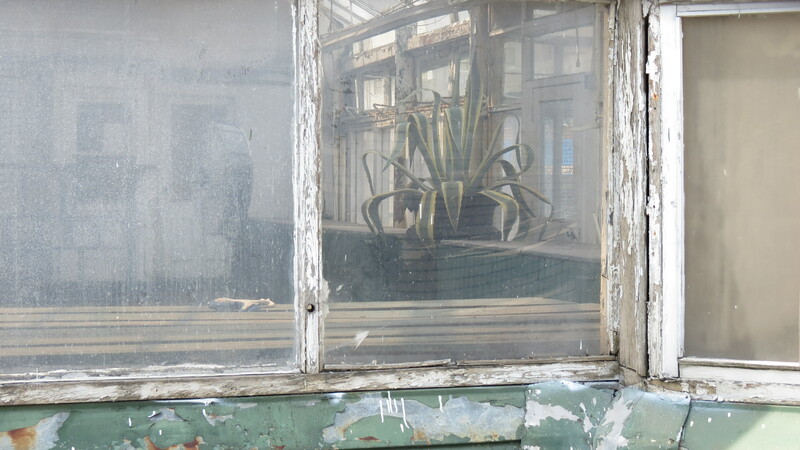 I’m not sure how long this agave has been here, but I like to think that as I look through the hazy glass, I am looking at the ghost of a plant from long ago. Next Post: The Brooklyn walking tour continues with views from the bridge and a parade of window boxes. It’s game day — at last. 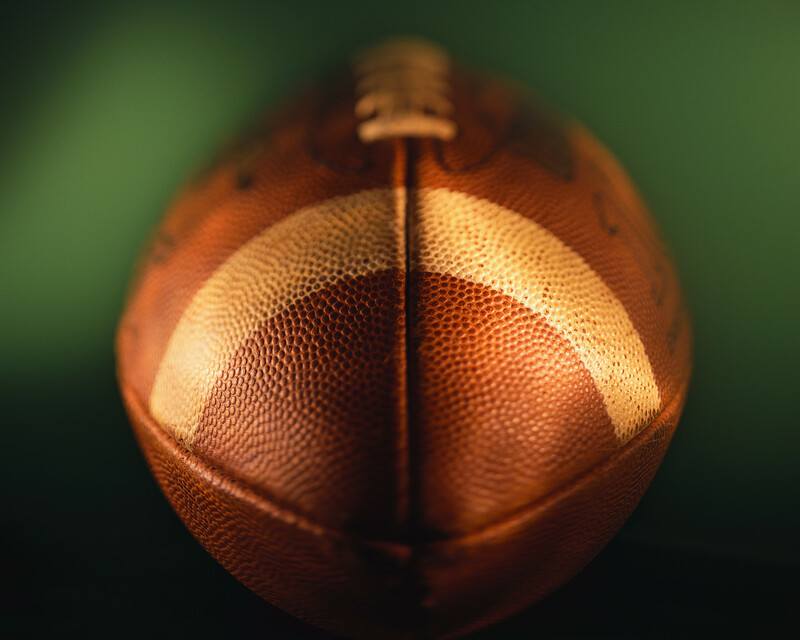 If you live in the New York Metro area — as I do — or in New England or Indianapolis, for that matter, Super Bowl madness has reached the saturation point. Every second of local news coverage is devoted to the teams, the fans, the food — even my local supermarket broke a record for the number of heroes that were ordered for Super Bowl parties. Don’t get me wrong — I am pulling for the home team. And I am excited to see the half-time show with Madonna. Yes, I know she made that remark about loathing hydrangeas, but I’m curious to see what the old material girl (yes, I went there) has in her bag of tricks. It’s just that gardeners need their Super day, their media coverage, their competition for the most clever gardening commercials. I doubt any of that will be happening soon, so I have decided to take matters into my own hands. I am a seedaholic – and this time of year is especially rough for me and others like me. 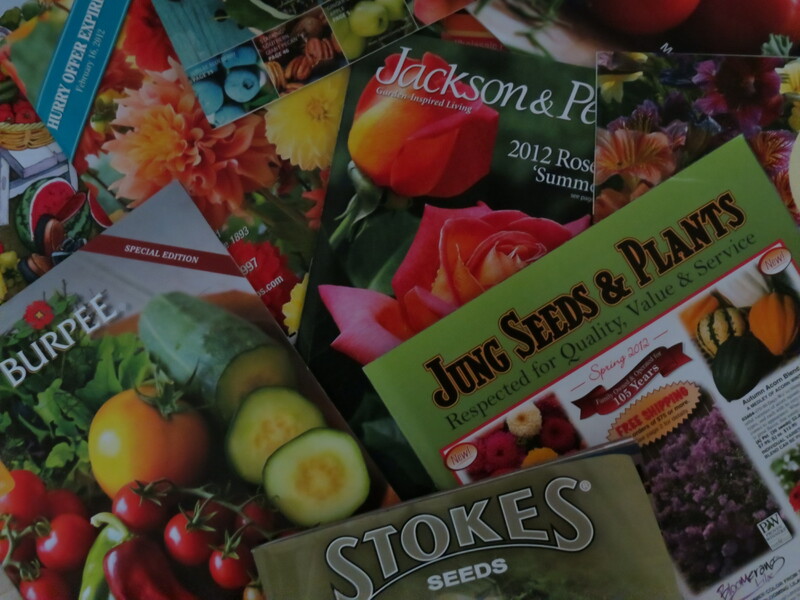 The seed catalogs have arrived, with all of their colorful glossy photos designed to tempt the gardener with promises of summer bouquets and homegrown vegetables – all of the scents and textures of life itself. Each time I visit the mailbox and find a new arrival, I wonder what the neighbors think. A wave of thrills and excitement passes through me. I clutch the catalog to my chest as if it was the latest issue of Tiger Beat and I’m a giddy 11-year-old school girl. And, I swear, I feel like skipping. Moss Rose, By Any Other Name . . .
Unplanned Portulaca crowds out the planned Geranium. A few posts ago, I wrote about gardening as a natural surprise party and my belief that my plants actually get together and come up with creative ways to entertain me and, well, surprise me — popping up in places where they had not been planted, blooming in different colors than were purchased or planned. But if I had to pick one plant as the organizer of all this guerilla gardening, it would have to be Moss Rose, or as I love to say, Portulaca. It’s actually a fun name to say, like Dahlia or Liriope. Pour-tchew-lack-uh. Sometimes I think it could be the name of a Native American guide leading early explorers westward or a wife of Caesar. Maybe it’s a resort, kind of like, “We’re taking a ride up to Lake Portulaca for the weekend.” Or maybe it’s the closest I come to referring to any of my plants by its proper Latin name. No matter what it’s called, though, Portulaca has been very, very good to me. These are Cherry Splash Hybrid Impatiens (left). I started the seeds in February. Everything I’ve read indicates that impatiens seeds need light to germinate, so do not cover them with soil. Each time I’ve done that, the results have not been great. Two years ago, I began to cover the seeds lightly, and this appears to work much better for me. I think it helps to keep the seeds moist. 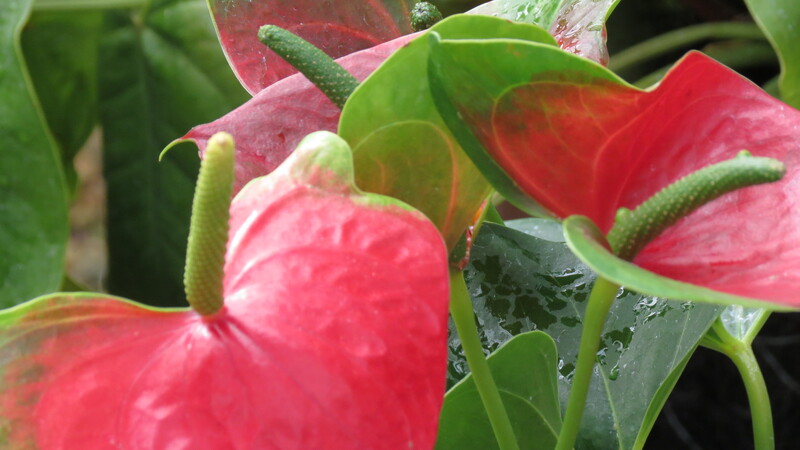 In any event, it is always very exciting when plants bloom while in the greenhouse. On the right is a group shot. 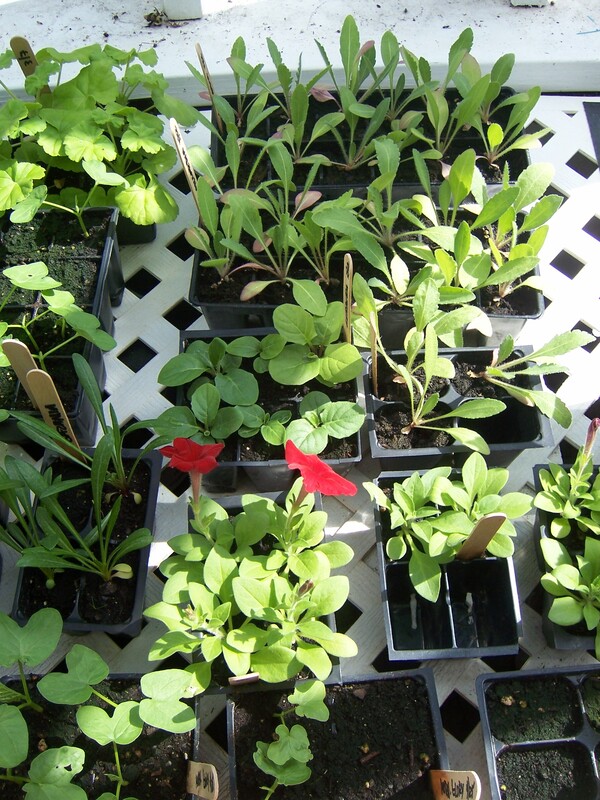 On the left, the plants with the red blooms are Easy Wave Red Petunias. Moving upward are Gerbera Daisy Crush Mix, and Blanket Flower Arizona Red Shades. 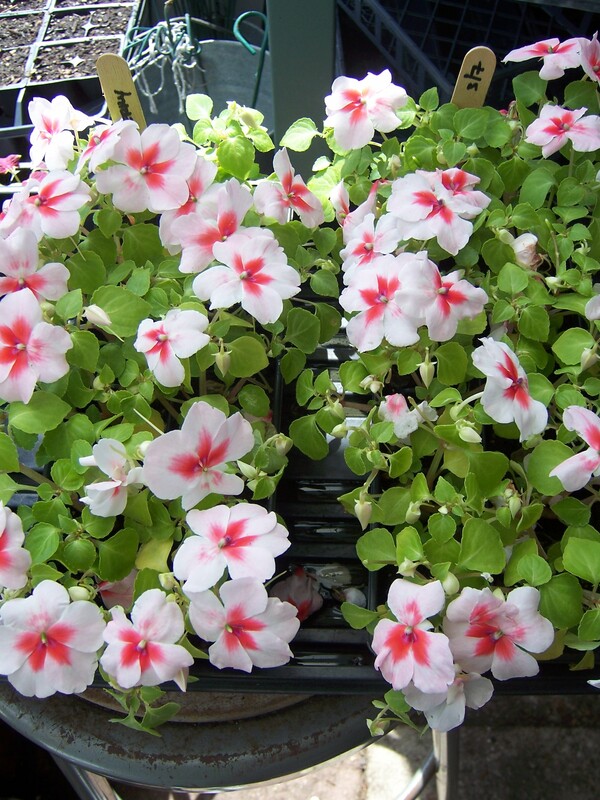 Here we have a variety of geraniums: Orbit White and Horizon Red Ice. The grassy looking plants just below the geraniums are Gazania Daybreak Petticoat Mix. These were also planted in late February. 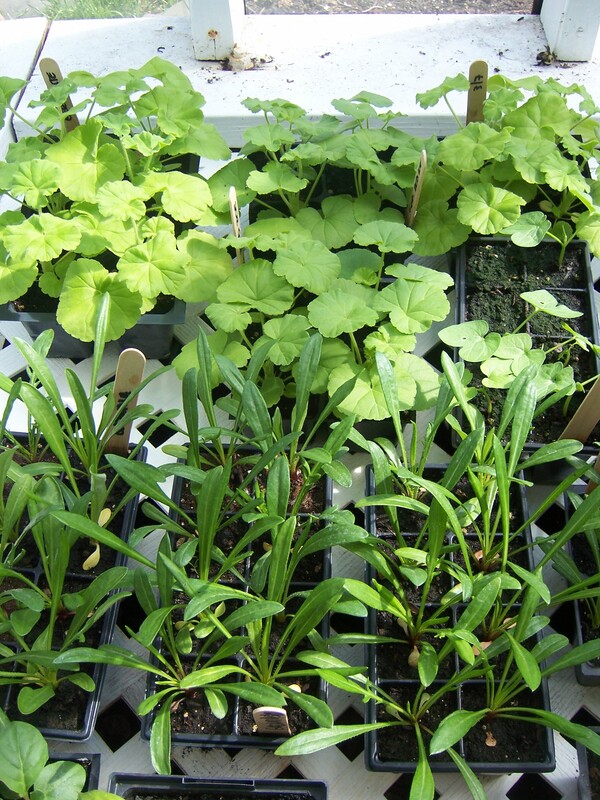 Actually, I find growing geraniums by seed relatively easy and rewarding. The seeds are large enough to handle (as opposed to the impatiens seeds), and I usually get a nice return. When I begin the seeds, I plant about five of the seeds in a single pot. It’s also important to water from the bottom to keep the soil from compacting and allowing the roots ample space to grow. 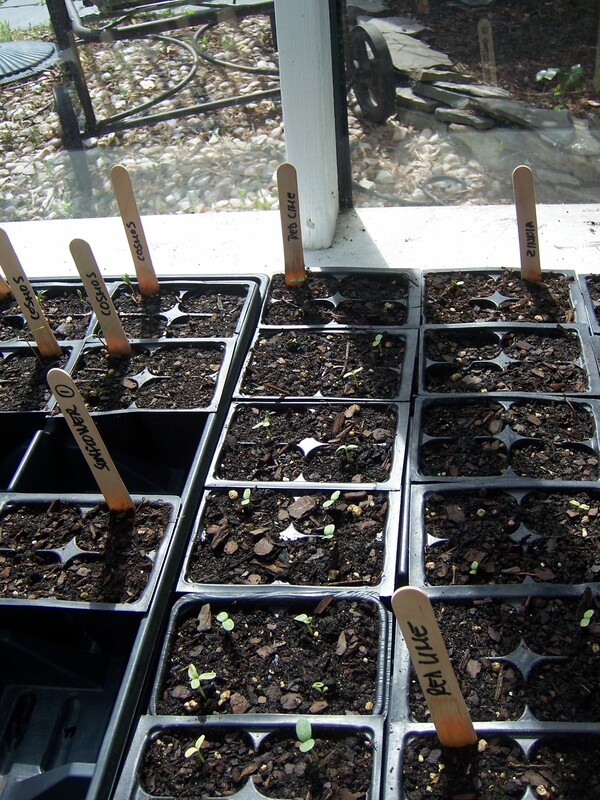 At this stage, the seedlings have been given their own space in which to grow. These are various zinnia, cosmos, and sunflower seeds. These are the easy seeds, which can be planted where you’d like them to grow. I planted some of these outside already. I’m not sure, though, if the weather has still been too cool for successful germination, so I planted extra seeds in these flats — kind of an insurance policy. After they develop their first set of true leaves, I’ll move them into the garden. The seeds are: Zinnias Elegans Queen Red Lime, Zinnia’s Pastel Cutting Mix, Italian White Sunflower, and Cosmos Double Click Cranberries. This is Coleus Carefree Mixture. 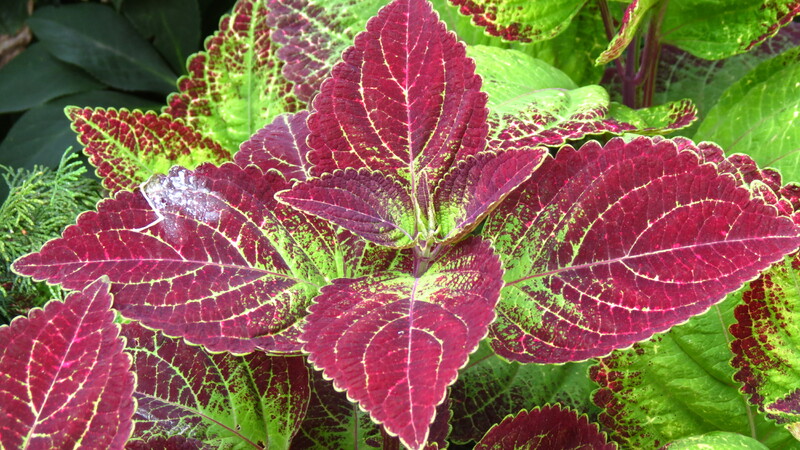 Coleus is one of those plants that bring me back to childhood. I like the variety of colors. I like the texture of the leaves. I like being able to pinch them to encourage branching. And I really like the ease of propagation: clip, water, root, plant. 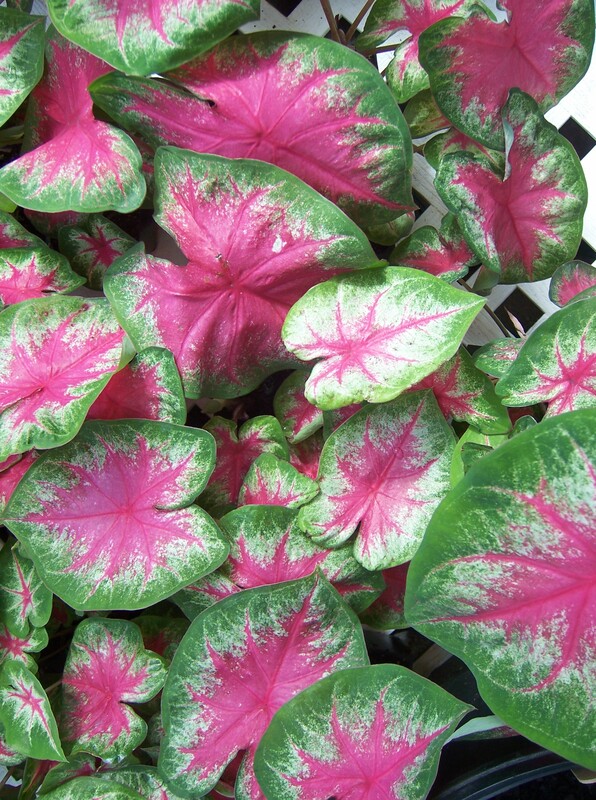 I purchased Caladium bulbs while on vacation in Florida. 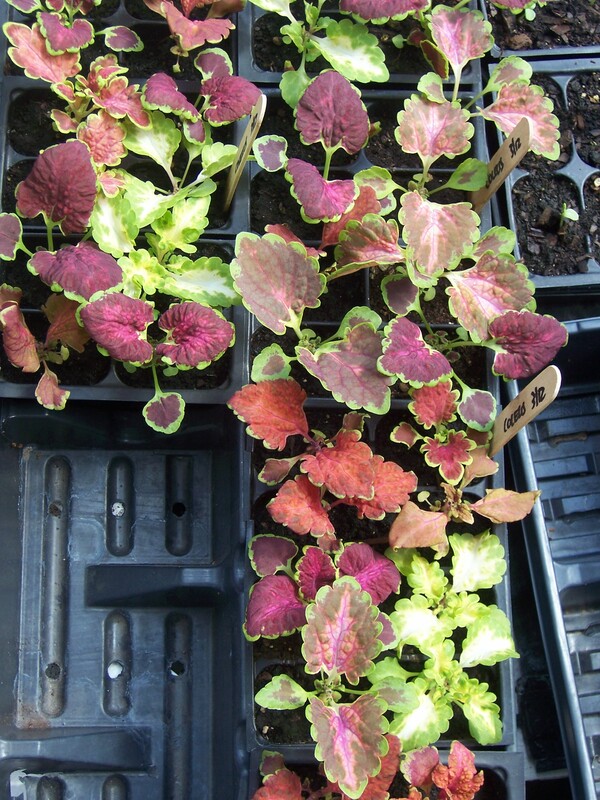 They’re a souvenir — a very colorful souvenir that will eventually be planted in very large pots that receive dappled sun. Well, that’s the tour of the greenhouse and what’s growing inside. Here’s hoping to a season of sun, just enough rain, lots of blooms, and very few pests.